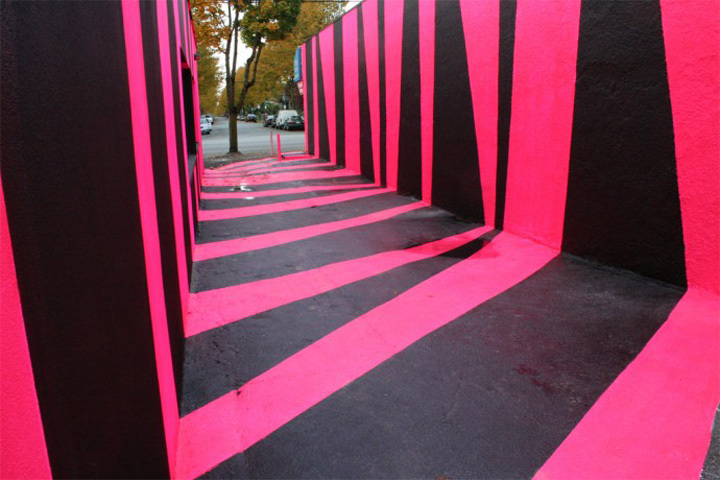 Nothing Happens in Good Weather was a short-term public art project by artist collective Instant Coffee that activated a narrow empty lot on a busy section of South Fraser Street. With wide stripes and strident colour, what was once a gap in the streetscape was transformed into an aesthetic and social space. Inspiring the community’s imagination, the space encouraged impromptu meetings, events and performances. Instant Coffee is a service oriented artist collective based in Toronto and Vancouver. They have an extensive art practice, spanning over ten years. At present, their most active members are Cecilia Berkovic, Jinhan Ko, Kelly Lycan, Jenifer Papararo, Kate Monro and Khan Lee. As a collective, they have been invested in combining the social with the aesthetic, and as such have worked in public spaces to engage large audiences. They have shown internationally, have exhibited in many prominent art institutions, and have produced numerous projects in public space. Currently Instant Coffee is working on a sculptural wall mural for the City of Edmonton and is engaged in a public commission for the City of Richmond. As part of the City of Vancouver’s Cultural Olympic programme, the Collective opened Light Bar, a full-spectrum light bar installation and venue for light therapy, light lectures, light shows, light reading and light rock. In 2009 Instant Coffee exhibited the Disco Fallout Shelter, at the Toronto Sculpture Garden, and as part of Subvision, Hamburg; Nooks as part of How Soon is Now, Vancouver Art Gallery; Light Bar as part of Assume Nothing, New Social Practice, Art Gallery of Greater Victoria; Bright Future as part of 88 Blocks Art on Main a Public Art Commission by Translink and Come In: Disco Fallout Shelter as part of LIVE 2009, Vancouver and Instant Coffee, Sølyst, Denmark. Other recent residencies and exhibitions include Light Bar Research and Residency, Kuenstlerhaeuser Worpswede, Germany and Flaggfabrikken/Bergen Kunsthall, Bergen, Norway; If You Lived Here You’d Be Home By Now, Henry Art Gallery, Seattle; Wish You Were Here, Casa del Encuentro MDE07 encuentro internacional, Medellin, Colombia. This project represents a unique partnership between Other Sights for Artists’ Projects and the South Hill BIA Public Art Committee (active members representing South Hill community groups, organizations, and businesses), in the commissioning of Instant Coffee to produce and present an artwork that addresses the goals and objectives of two different art initiatives: The South Hill Mural Project curated by Barbara Cole, and South Hill Surfaces coordinated by the South Hill BIA Public Art Committee. Other Sights gratefully acknowledges the support of the City of Vancouver 125th Mural Program. The South Hill BIA Public Art Committee is grateful for project assistance through a City of Vancouver Community and Neighbourhood Art Development Grant.